Investigative journalist Jorge Luis Sierra has developed an app that helps to protect journalists in the field. 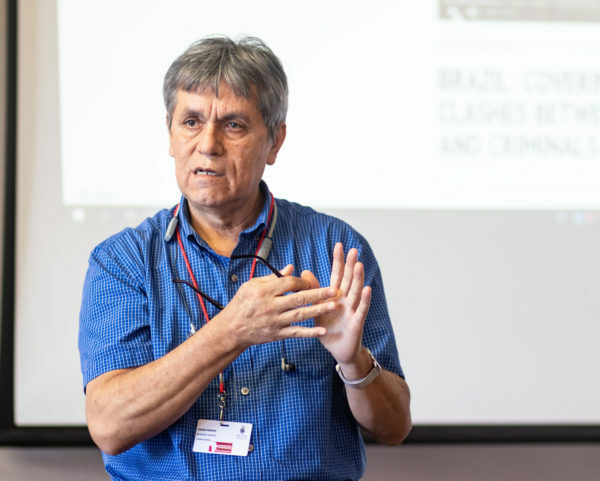 The overlooked challenge of personal safety for journalists who report on violent protests motivated Jorge Luis Sierra to create the Salama app which was developed as part of Sierra’s Knight Foundation Fellowship in 2015. Sierra was speaking about the app at the annual African Investigative Journalism Conference (AIJC) in Johannesburg on Tuesday, October 30. Sierra, a journalist and trainer, developed the free web-based app to help journalists to assess and mitigate their risks when reporting on volatile situations. Salama tracks and maps crime, corruption and attacks on journalists in a given geographic region. It also helps reporters assess their level of digital and physical risk in any protest situation. The app does this through embedded resources such as a digital collaborative library that archives the first-hand experiences of journalists who have worked on high-risk assignments. Sierra says he got the idea after his experience covering protests in his home country of Mexico. “Mexico is one of the most dangerous countries for journalists and we need to learn how to protect ourselves,” said Sierra. Salama is available in English, Arabic and Spanish. The app has been used in countries such as Iraq as well as some African and Latin-American countries, according to Sierra. Audience members were moved to share their own experiences in covering violent protests and the safety challenges they faced. “We made connections with our local police who were able to give us reflective gear to identify ourselves, said Kathryn Cleary, who covered the 2015 #FeesMustFall protests at Rhodes University for Oppidan Press. “But they [the university] brought in public order police who instituted curfews and killed off all the streetlights on campus. “All you could see were the flashes from when rubber bullets were being shot,” Cleary added. In 2016 military and police forces in South Sudan used live ammunition to disperse protesting students at the University of Juba, according to David Danga of the Juba Monitor. The students were contesting the outcome of the student leadership elections at the time and journalists found themselves targeted by the security forces. Sierra emphasised that reporters should always prioritise their safety. “Many reporters have died because they have taken bad decisions. There is no story worth your life,” Sierra said. Sierra was presenting a workshop on the second day of the 2018 AIJC which will ends tomorrow. Wits Vuvuzela, German journalist lifts the lid on predatory science, October 2018. Wits Vuvuzela, Exposé prompts cough syrup ban in Nigeria, October 2018. Wits Vuvuzela, Collaborations key to creating safe spaces for journalists, October 2018.